A drive through Death Valley, with three short hikes that explore the highs and lows (altitude-wise) of the area. Badwater, the lowest point of the US for a hike across the salt flats. Starting at Beatty, outside the park, I start fairly early as the morning light is best for photography of the salt pans. There’s nice morning light and no traffic as the dead-straight road (Highway 374) heads for the Grapevine Mountains. Visibility is still a bit obscured by smoke from fires burning in California. It’s a surprisingly hilly place – there are multiple mountain ranges between the vast plains; Death Valley itself is bounded by the Panamint Mountains on one side and Amargosa Range on the other. Directly ahead of Highway 190 is the Amargosa Range runs which along most of the eastern side of California’s Death Valley, separating it from Nevada’s Amargosa Desert. Its highest peak at 8,738 feet (2,663 m) is Grapevine Peak. My first stop is Zabriskie Point, which is at the foothills of the Amargosa Range. There’s a very short walk to a popular lookout here, which provides a vantage point over the desolate landscape. Looking west, across Death Valley, is the Panamint Range in the background. The jagged peak in the middle is Manly Peak, located half inside Death Valley National Park, and half inside the Manly Peak Wilderness area. To really experience the desert landscape, there’s two short, circular hikes that start here: the Golden Canyon Loop and the Badlands Loop. I’m taking the shorter (2.7 miles / 4.3km) Badlands Loop, which gives you a great feeling for the dramatic landscape. The hike, sign-posted by frequent arrows and easy to follow, heads down a narrow gully carved by infrequent (but heavy) rain to Zabriskie Point Junction. From Zabriskie Point Junction the trail follows a much broader gully, which is a major artery of Gower Gulch, in a south-westerly direction. After about 1.3 miles there’s a junction, which is also the lowest point of the Badlands Loop. Continue straight ahead down Gower Gulch (and back via Golden Canyon) to form a longer circuit. Or head back up a narrower gully to complete the shorter Badlands Loop, which is what I do (I’m doing the circuit in an anti-clockwise direction). From the junction the track ascends from Gower Gulch, following the ridges of the hills. Looking much like sand dunes, you can almost visualise the ancient lake bed being folded and faulted into the irregular white hills that exist today. This is the most spectacular part of the short loop: as the trail ascends along the ridges of the hills, you can see the rugged terrain, and the Panamint mountain range in the distance. Towards the end of the Loop, I can see Zabriskie Point in the distance (top right of the photo below) and the gully that leads back to the starting point. Rather than following the marked track back, I head straight up one of the ridges that leads towards the lookout. It eventually becomes a rough track obviously used by others to reach the lookout point. From Zabriskie Point, I take – which is now starting to get a bit busier – I take a last photo of the panoramic views. My next stop, a bit further along Highway 190, is Dante’s View. While not as high as Telescope Peak, it provides one of the best views over the white salts flats and most of the 110-mile long Death Valley. Getting there is half the fun, with Dante’s View Road rising steeply up from Highway 190 to the viewpoint. The views from the parking are pretty impressive, even without walking anywhere… but a couple of short trails provide even better vantage points. To the south-west of the car park, a trail leads down the ridge. The views from the trail take in the salt flats of Badwater at 282 feet (86m) below sea level and directly behind it (at the very top left of the photo) Telescope Peak at 11,049 ft (3,368m) above sea level. As you descend further down the ridge on the rough track, you can see further down the length of Death Valley to the north. It feels like you could continue down the ridge all the way to the salt flats… but we’re still 5,275 feet (1610m) above sea level. At the northern of the car park, another trail heads up the ridge – it goes for four miles up to Mt Perry (I only went about 0.3 miles). The outlook is pretty much the same as from the southern end of the carpark, although it’s more of a rocky and rugged environment. And there are no other people around. 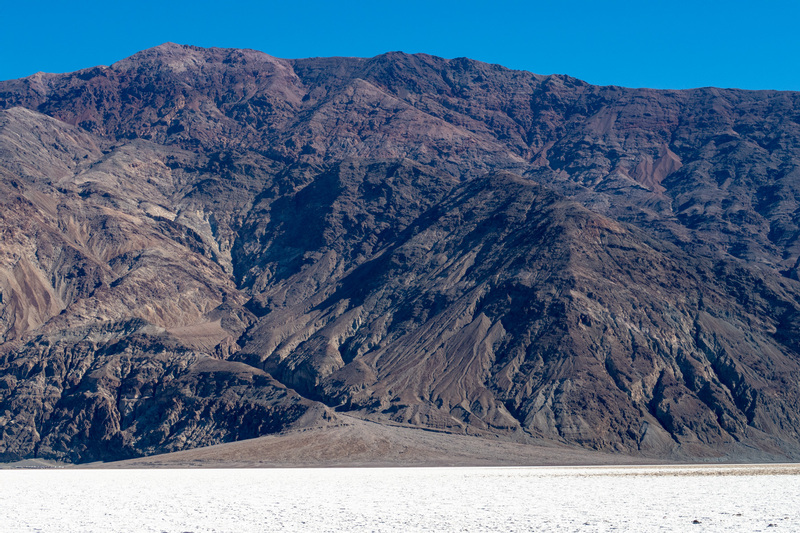 There are unimpeded views of the Badwater salt flats and the Panamint Ranges. The main benefit of hiking in this direction is that you also get the slightly less impressive view to the east, of the Greenwater Range. From here I need to back-track a little, heading back up past Zabriskie Point toward Furnace Creek, and then down Badwater Road. One of the main roads through Death Valley, Badwater Road follows the foothills of the Margarosa Mountains. The first section is almost dead straight and seems to go forever… many of Death Valley’s attractions are along this road, including Badwater. Near the carpark and at the edge of the salts flats is a spring-fed pool – the accumulated salts of the surrounding basin make the water undrinkable. The name is thought to have come from an early explorer’s horse who refused to drink, thus giving rise to the name “bad water”. A long, white salty “finger” stretches out from the end of the boardwalk, providing access onto the salt flat. 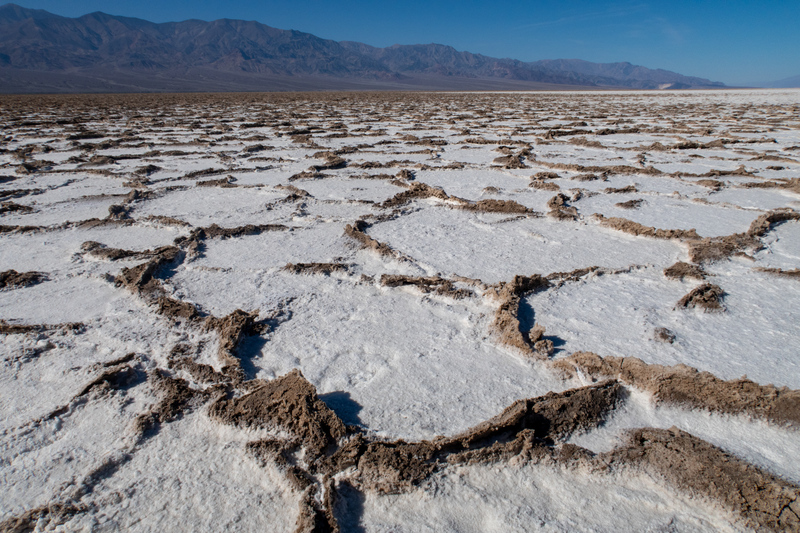 I later read that one should stay on the boardwalk to avoid crushinng the tiny Badwater snail – but there’s no signage requesting visitors to stay off the salt, and most people are venturing onto the salt flat. Looming high above Badwater are the Black Mountains, part of the Amargosa Range – Dante’s View where I’ve just come from is almost 6,000 feet above me. Continuous freeze–thaw and evaporation cycles have created the hexagonal honeycomb patterns of the salt pan, which stretch all the way into the distance to Panamint Mountains on the other side. I walk as far as I can. It’s about two miles to the far end of the salt pan, below the towering Panamint Range, where the smooth salty surface ends. A bit further on is Shorty’s Well on the opposite side of the salt pan, and the starting point for a very arduous hike from -282 feet up to the Telescope Peak summit at 11,049 feet! From the salt pan I continue down Badwater Road, which winds around the edge of the salt flats and the foothills of the Black Mountains for a while, before becoming dead straight again. Towards the end of the Black Mountain range, the road bears east and crosses the mountains at Jubilee Pass, before leaving Death Valley National Park. I think I’ll be back – there are many more walks I’d like to do, and while I’ve always associated Death Valley with the salt pans, there’s a huge diversity of landscapes. Location Anywhere in / around Death Valley – I found relatively inexpensive accommodation at Beatty, just outside the park. Grade Easy. Minimal elevation gain for these hikes/=.